The called him “The New Hermes,” a reference to his uncanny abilities in leather and exquisite construction. But he was maybe a bit too irreverent, too deliberately immature, for that moniker to stick. Jean Charles de Castelbajac emerged in Paris in the late ’70s alongside an angst-ridden generation of designers who were ready to redefine the future of fashion with everything pret-a-porter could muster. 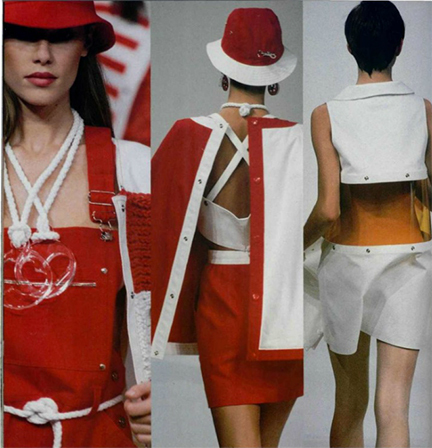 Kenzo, Montana, Mugler, Rykiel and, eventually, Gaultier; while they all entertained a certain amount of humor that was, at that time, unbecoming of French fashion, it was and his particular joie de vivre that was especially infectious. 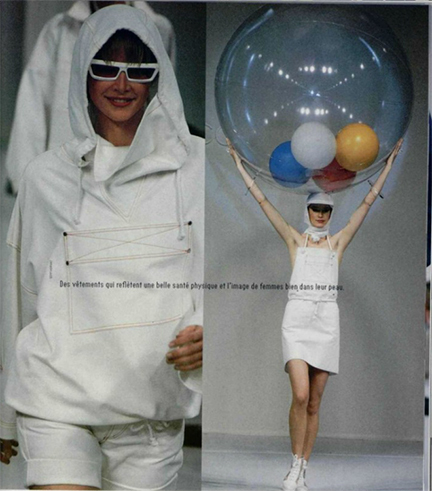 Becoming a poster boy for inventive French fashion in ’80s, it was in the early the ’90s that he caught the eye of Space Age legend André Courrèges who appointed the Castelbajac to carry on his legacy. The collaboration was short-lived, lasting only two seasons. But it highlights a rather under discussed facet of the Courrèges mythology. In the wake of the Space Age Courrèges shifted gears. His interest in futurism and space-inspired clothing was never purely formal, for him it was a means to optimism, to progress and, most importantly, to a better way of life. As the ’70s came around he applied his futurist ethos to sportswear, presaging the athleisure trend fashion is currently undergoing. It suited his specific philosophy on life and living: active, healthy, celebratory and fun. FYI, when Christophe Lemaire did Lacoste, it was this idea of sport and that guided his direction for the brand. 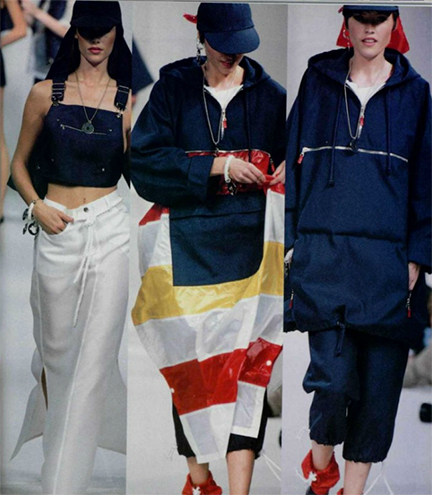 For Castelbajac, in the midst of minimalism in the early ’90s, it was an interesting exercise that gave way to inventive, witty, and ebullient clothing. And it’s currently of note not because of its relationship to the recent revival of the house of Courrèges by designers Sébastien Meyer and Arnaud Vaillant, but actually because of the collection shown the just the day before by Simon Porte Jacquemus. In recent seasons the punchy (not to mention extremely crushable) young designer has become Paris’s new enfant terrible. Unapologetically French, playfully precocious, and fearless in his use of abstracted form, he favors the same bright gestures and visual hyperbole that was a signature of Castelbajac while his brand philosophy, which espouses confident living and a childlike openness to new experiences, is not dissimilar from Courrèges. In many ways he has picked up were Castelbajac left off in 1994. The collection he showed for Spring Spring/Summer 2016 was as tender as it was violent, a youthful rebellion against the tyranny of mature appropriateness. It seemed to outline esoteric attitudes of dress for pretty young things, simultaneously sexualizing and dismissing their bodies. 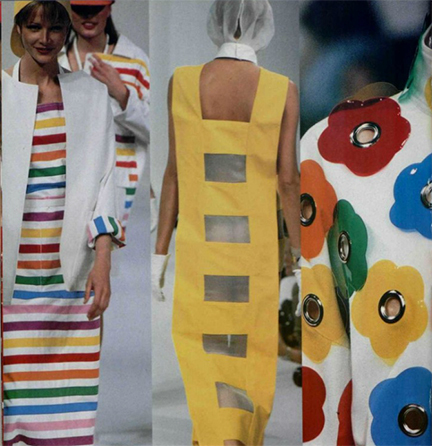 It was pop and perky, seductive and quirky, and while it only looked on to the future, it did make one think of the past: a time when fashion could inspire emotion, when clothes could make you feel something beyond consumerist pangs of desire. It was a collection of the future, surely, but it managed to take you back. Back to a very a good place. 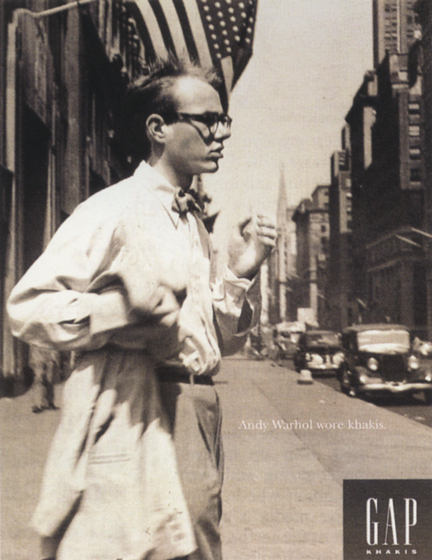 Khakis reimagined with imitable cool –‘ such was this Gap advertisement which was one part of a larger campaign featuring various icons (though none as subversively charming as Warhol) wearing their classic khakis. You see, tan colored twill chinos are actually cool. They are timeless, unassuming, and by being so they can ensure your own identity and perhaps a future of fame, to come through unfettered by strains of fashion. This would be a value. And so the Gap would begin its transformation of the generic and mundane into a feverish universal desire: the greatest common denominator of cool, just in time for the upswing of ’90s minimalism.